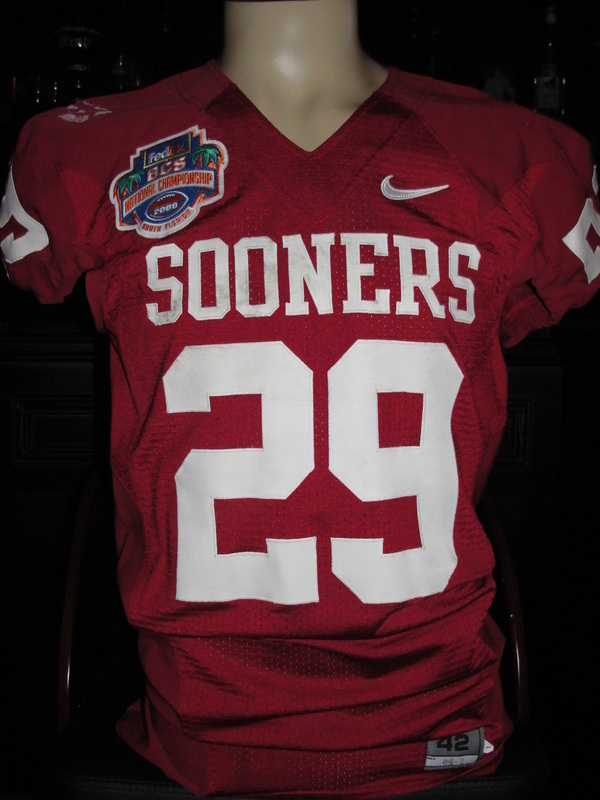 To honor the tradition of Oklahoma Sooner Football, the University broke out "The Legacy Series" uniform to open the season on August 30th, 2003 vs. North Texas. 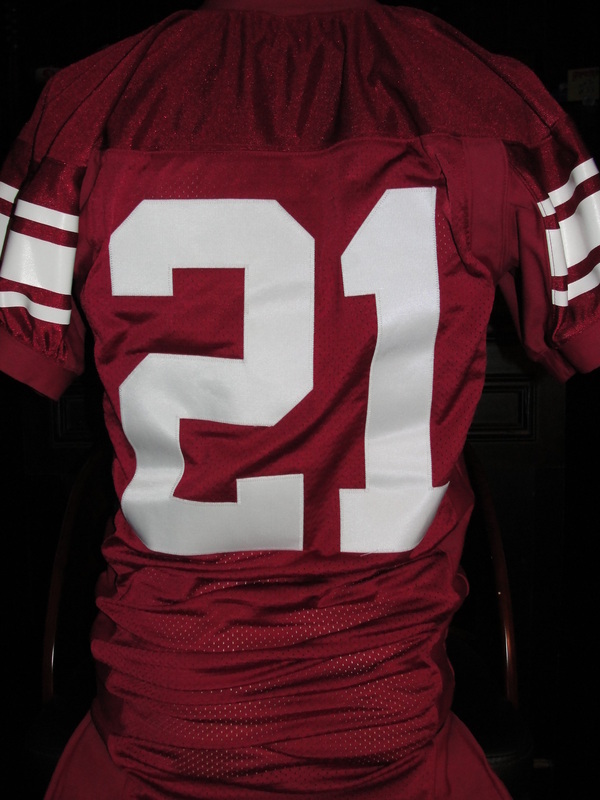 Staying with the theme of the "throwback look" there were NOT nameplates attached to the back of the jerseys for this game. 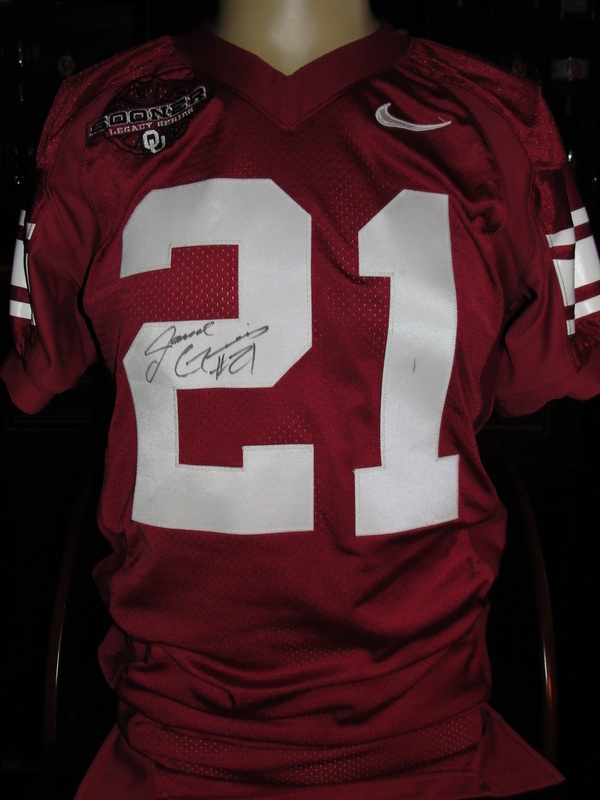 Mr. Gutierrez autographed the front of his jersey, during his freshman year at the University of Oklahoma. 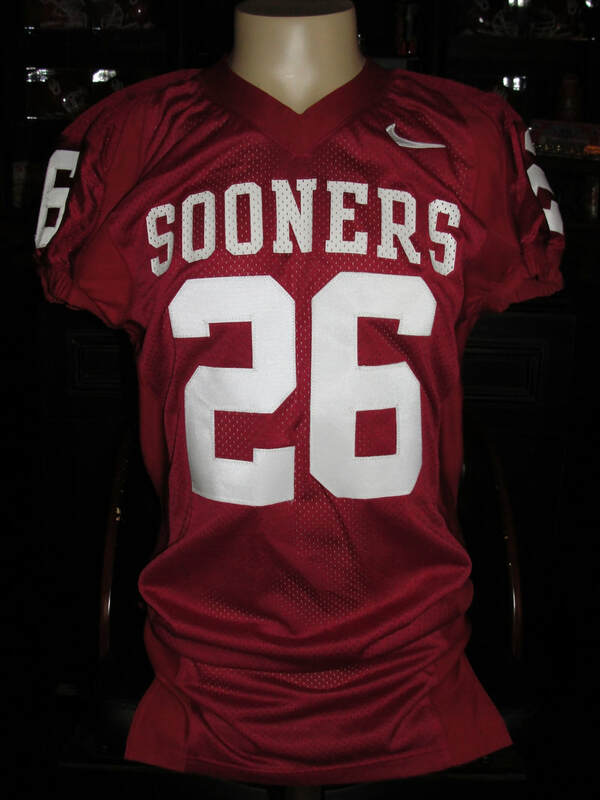 To honor the tradition of Oklahoma Sooner Football, the University broke out "The Legacy Series" uniform to open the season on August 30th, 2003 vs. North Texas. 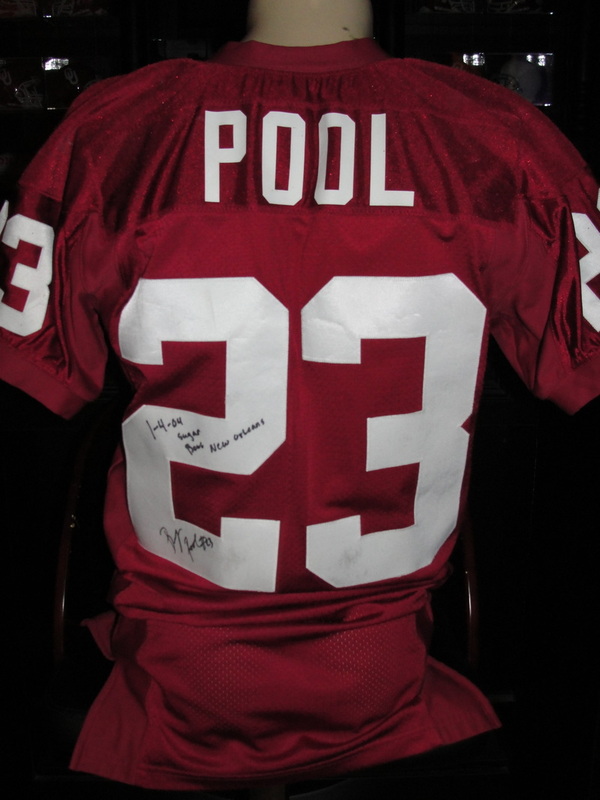 Mr. Williams autographed the front of his jersey, during his freshman year at the University of Oklahoma. 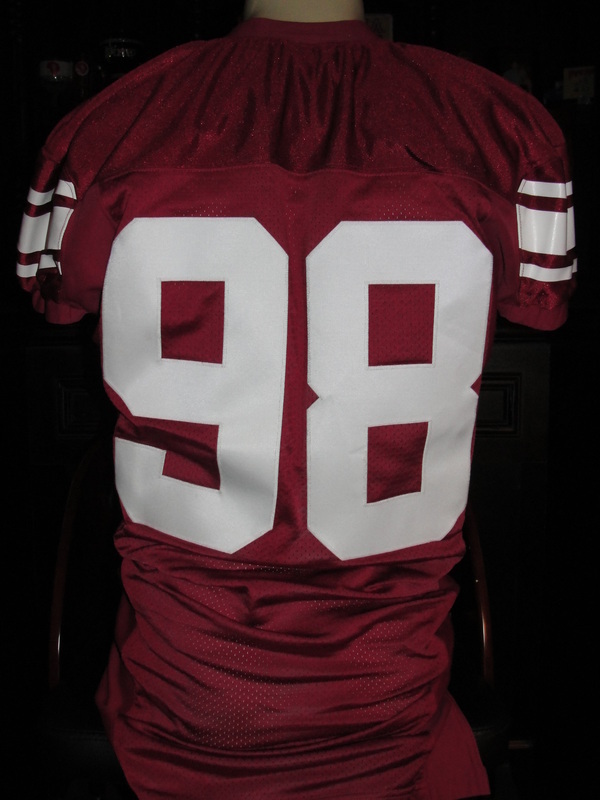 Staying with the theme of the "throwback look" there were NOT nameplates attached to the back of the jerseys for this game. The Traditional Big 10 vs. Pac 12 Rose Bowl match-up was interrupted with the existence of the BCS. 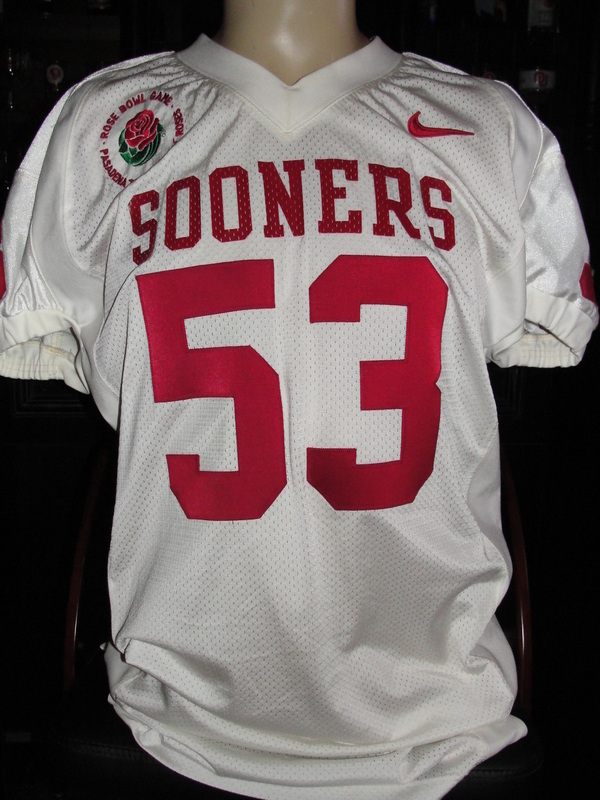 Oklahoma made its first and only appearance in the Rose Bowl game in 2003. 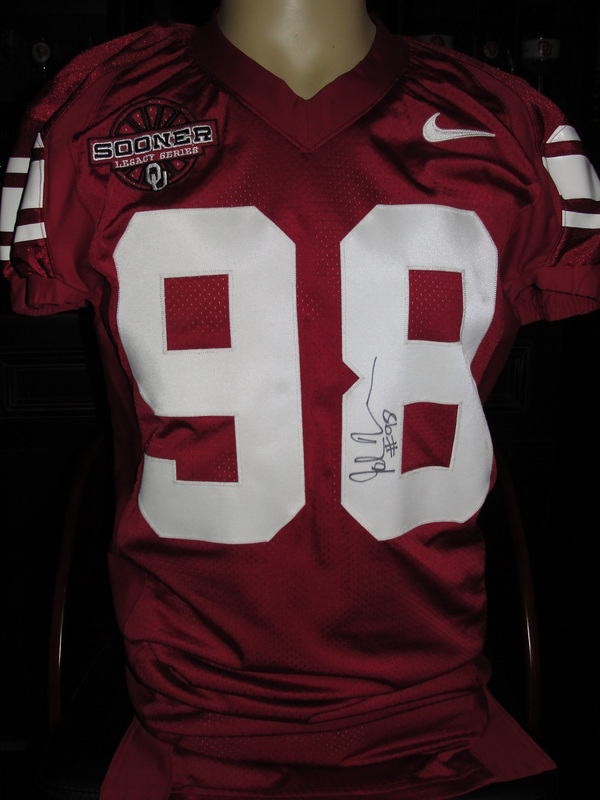 Pasha Jackson (Juco-Transfer Linebacker along with fellow teammate Lance Mitchell) made an impact from the line backing position during his time at Oklahoma. 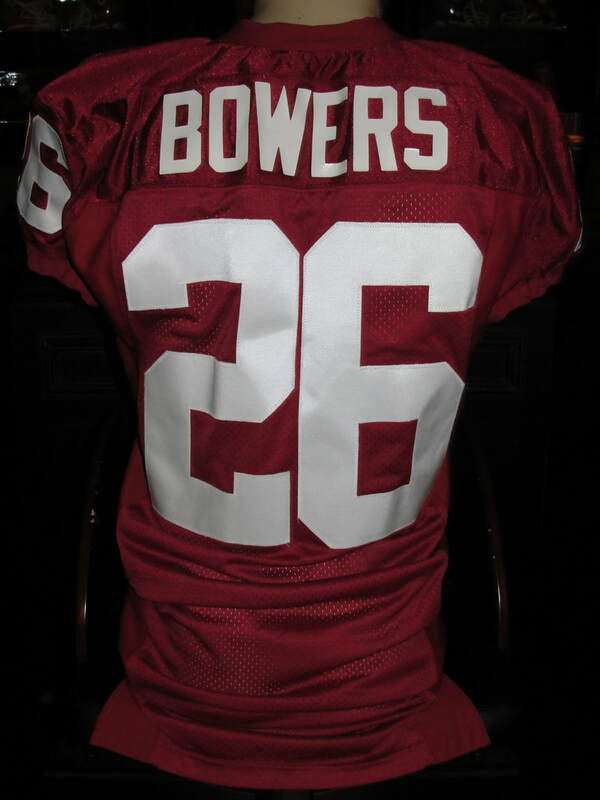 The nameplate has been removed from this jersey but loose strings and the outline remain evident. 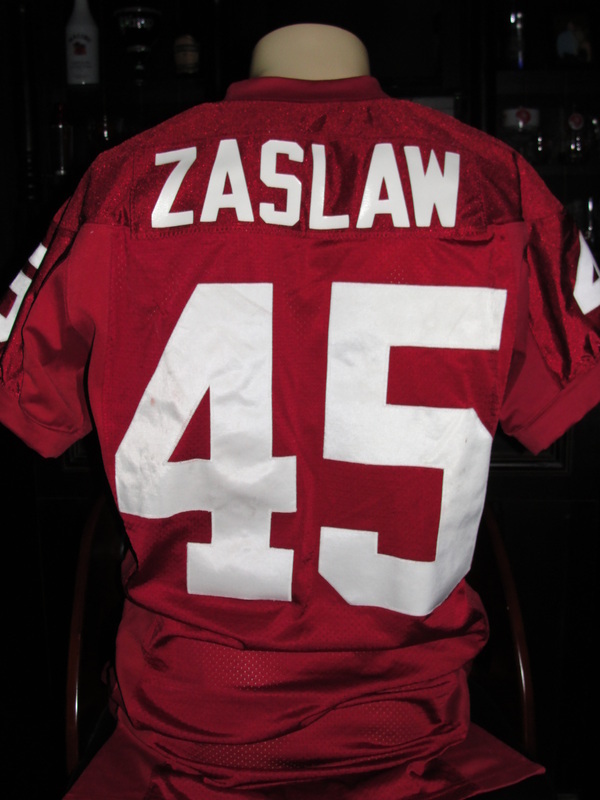 Zaslaw was a highly recruited fullback/linebacker from Edmond Memorial HS in Oklahoma. 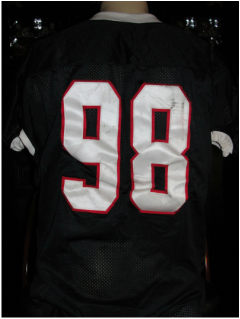 After starting his career as a linebacker, he finally settled in on the offensive side of the ball, primarily as a lead blocker. 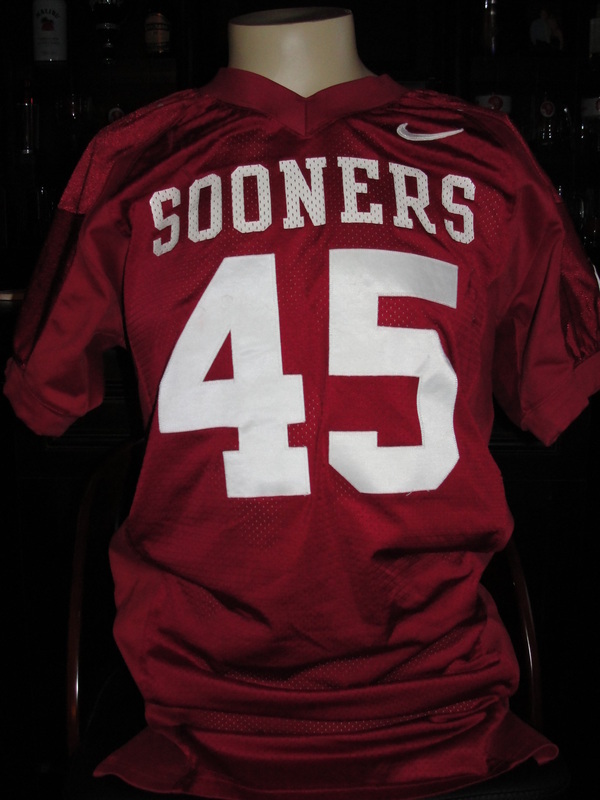 After wearing the #40 his first few years on campus, he switched to #45 for his final years. 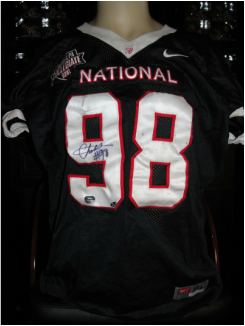 This jersey shows light game use with wear and several hit marks. 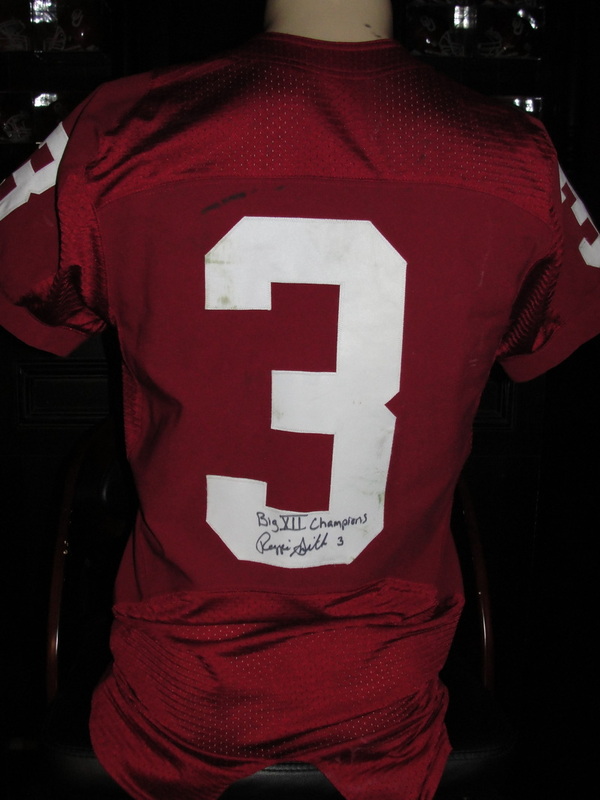 In one of Bob Stoops more trying seasons of his career, he elected to play the 2006 Season without individual nameplates on the back of the Sooner jerseys. 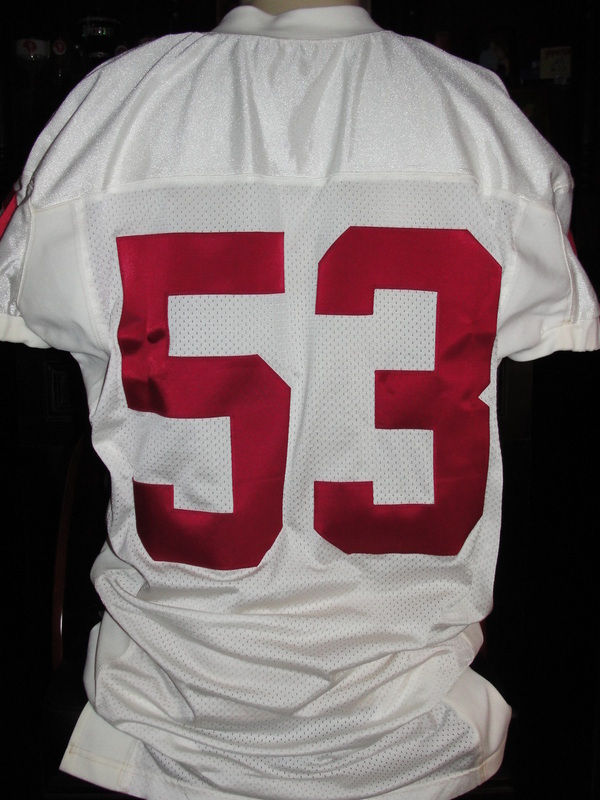 This was an attempt to have members of the team play for the name on the front of the jersey and not on the back. 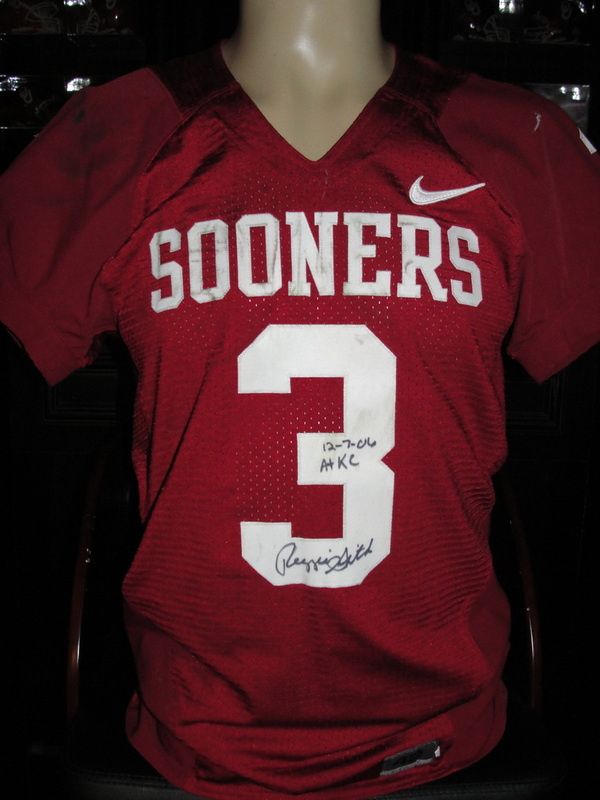 This jersey is hammered with hit marks, stains and team repairs. 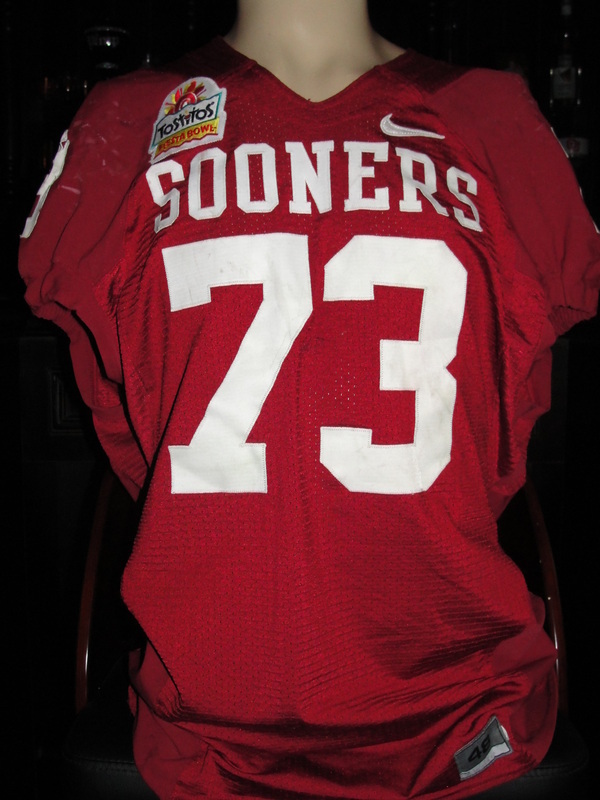 Mr. Walker a starter and key cog in the Sooners interior offensive line wore this jersey in the (all-time underdog story game) 2007 Fiesta Bowl vs. Boise State. A game known for it's wild finish and multitude of trick plays, as Boise State trimmed Adrian Peterson and Oklahoma 43-42 in overtime. 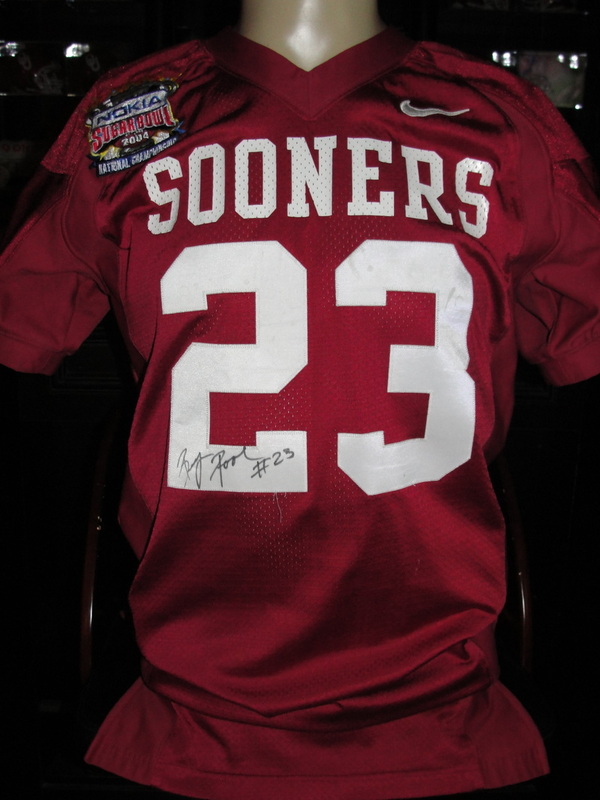 Chris Brown wore this jersey on January 8, 2009 in the FedEx BCS National Championship Game (Orange Bowl) vs the Florida Gators and Tim Tebow. 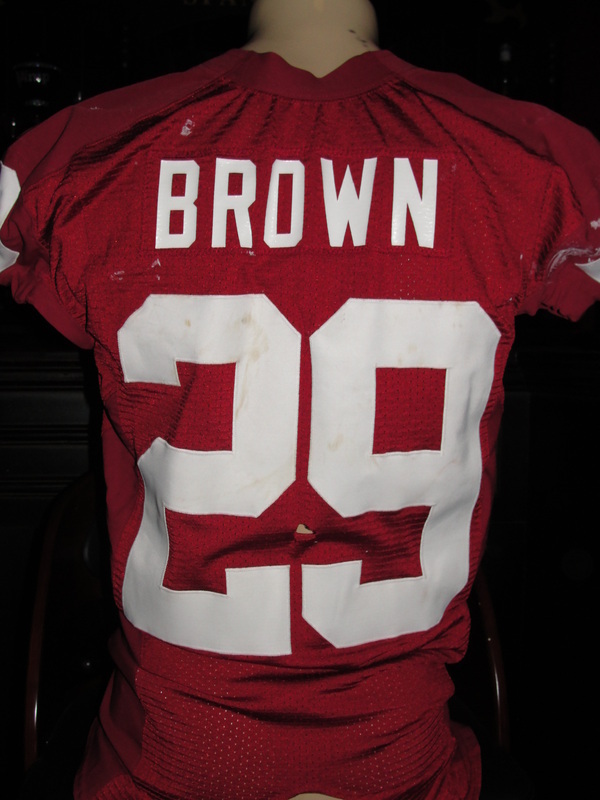 Brown rushed for 110 yards on 22 carries and had 2 receptions for 37 yards. 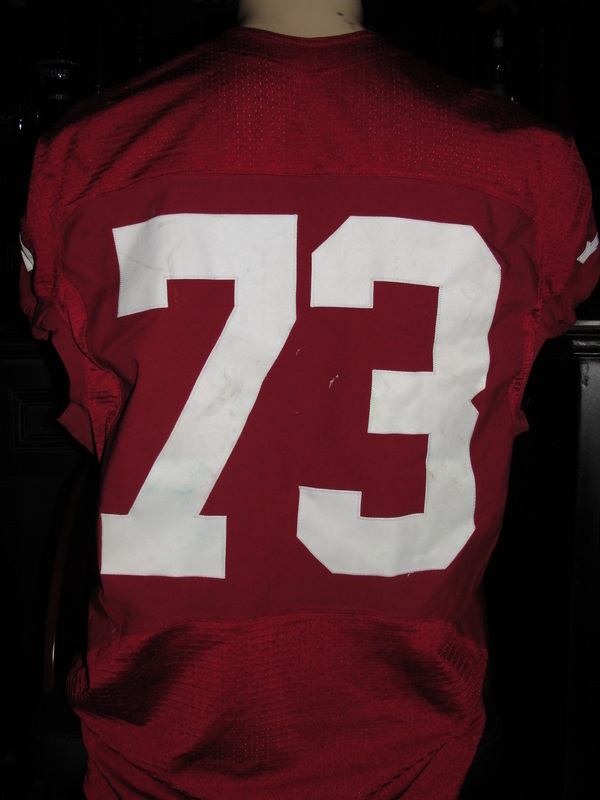 The jersey is littered with hit marks, paint and tears. One of the easiest photo-matched jerseys in my collection. Unfortunately, Oklahoma came out on the short end of the scoreboard, failing to take advantage of numerous trips inside the redzone. Losing the BCS Championship game 24-14.